Are there any Arrested Development fans in the house?? This creative cash gift idea is for you! I think I can safely say the following, as the show has been out for a very long time. However, if you are worried about spoilers, you’re going to have to go ahead and skip the rest of this post. 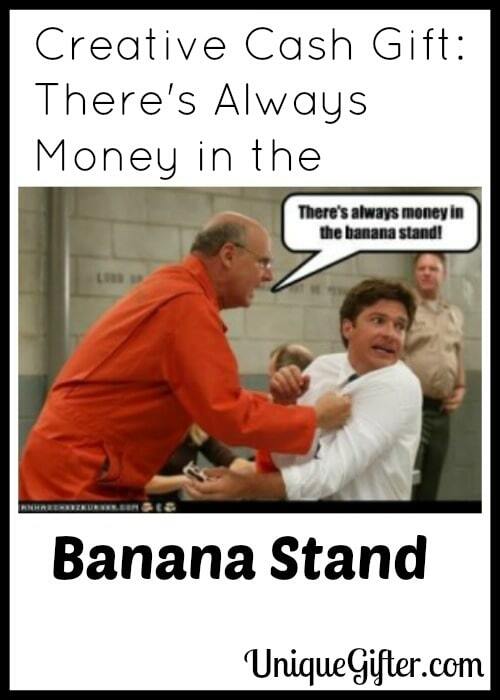 I think everyone remembers the phrase, “there’s always money in the Banana Stand” from the show. If you don’t quite remember, George Sr. says this in prison. Later, when George Michael and Michael burn down the Banana Stand, they find out that George Sr. meant there was literally money lining the walls; $250,000 in fact. I’m not suggesting that you give a gift of $250,000, though it would be pretty amazing if you could. However, you can still give your own version of “Money in the Banana Stand.” There are a few different ways to go about this. First up, if you are giving this as a cash wedding gift, please read about eTransfers and cheques, no one wants your cash gift to go missing! This one requires a bit of skill with cardboard and construction paper. That said, any die-hard Arrested Development fans will immediately recognize it (assuming your handicraft level is mediocre). Make a mock up Banana Stand and put an eTransfer password inside, or your check inside. I suspect there are people out there who actually use these things, but even if you don’t think that your friends will, you can still use it to make a joke. They are available on Amazon for $10-15, or you could probably pick one up at your local dollar store. If you plan to put your cash gift in the box, make sure that it is extra clear in your awesome card, otherwise an unsuspecting thrift shop buyer may end up with a big payday! These things make me laugh every time. They are also the easiest way to give a Banana-themed cash gift. Buy one, pop your gift inside and write “There’s always money in the Banana Stand” in your card. They are often found by the tills in outdoor shops, or in the cooking sections at REI and MEC. You can buy Banana Guards online , too. Finally, for those who don’t already have the DVDs (or the upcoming movie!) consider tossing a few dollars in with a box set of the Arrested Development DVDs . Have you ever accidentally lit money on fire? I have never accidently lit money on fire – thank goodness! As usual, great gift suggestions. The banana hanger is cool! Hehe. I think they have mostly gone out of fashion these days, but I bet some people still use them a lot! I like your new blog design and logo…looking good! I'm working on one myself…but I have a long way to go before it's ready. Thank you! It took awhile to come together, but I'm very happy with it. I can't wait to see what you do! I really like your new logo. My husband LOVES Arrested Development. I have yet to watch it, but it sounds like I should. Banana stands crack me up. They are kind of like those multi tiered wire mesh fruit baskets from the 80's. Thanks :-) Haha, you have to watch some Arrested Development! I remember those fruit baskets as well.